This evening, the Wellesley Community will gather to honor the three recipients of the 2015 Wellesley College Alumnae Achievement Awards. 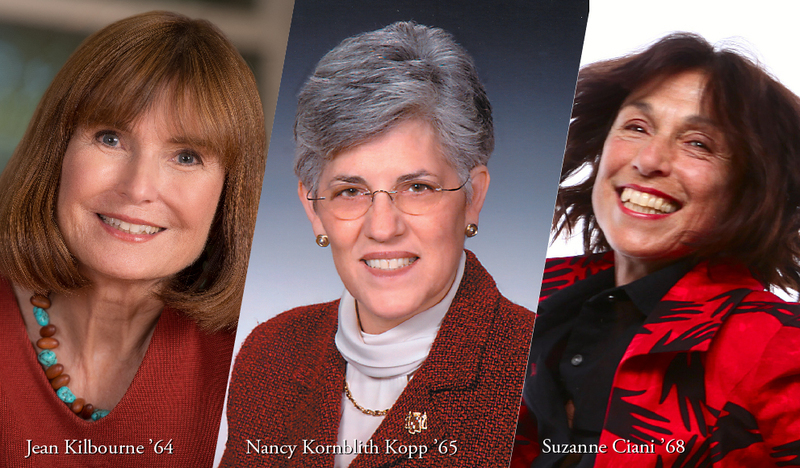 Congratulations to Suzanne Ciani ’68, Jean Kilbourne ’64, and Nancy Kornblith Kopp ’65! The Achievement Awards, which have been presented annually since 1970, are the highest honor given to Wellesley alumnae. Recipients are alumnae of outstanding achievement and distinction in their fields of endeavor; who will effectively inspire students; and who reflect the diversity of Wellesley women and their accomplishments. A ceremony celebrating the accomplishments of the 2015 Alumnae Achievement Award recipients will be held tonight, Thursday, February 12, 2015, at 5:30 PM in the Diana Chapman Walsh Alumnae Hall Auditorium with a reception following in the Alumnae Hall ballroom. The award ceremony and reception are free and open to the public. You can browse a list and read profiles of the past years' award recipients, from architect Eleanor Redmond 1909 to nonprofit executive Ophelia Dahl DS'94, Secretaries of State Madeleine Albright '59 and Hillary Clinton '69, journalist Callie Crossley '73, sustainable food pioneer Eva Sommaripa ’63, author Nora Ephron '63, astronaut Pamela Melroy '83, and costume designer Patricia Zipprodt '46, among many others.